I know there haven’t been news lately and i apologize for this. The end of 2018 has been very busy for me as i moved and my father fell ill sadly. I’ll spare you the details but working on the game has been complicated since then. However, i have resumed work and can share with you the current status of the game. All the enemies, ships, weapons and game objects are done. 4 levels are done. The UI and menus are about 85% done. There are still some things that need to be improved here and there but overall, the main focus is now game balance and finishing/polishing a few levels as well as finishing the steam integration (which is going well). The last thing that has been worked on is putting every value into files so that we can more easily change the balance of the game (rather than having to recompile everything with each change), making it 100 times faster to make changes and evaluate their impact. Sadly, i hadn’t planned for this at the start of development. I am hoping for a mid 2019 release which i think is pretty realistic considering the work already done (which means in 5 to 6 months). It has been very quiet on the website for some time and we have been too busy working on the game, finishing the bosses, level designs and polishing everything to post here. We’ve also been delayed a bit by computer issues (my laptop’s graphic card dying, mainly) and thus the game will be delayed a bit as well. We’re now aiming for a first semester 2018 release and we’re getting closer by the day. There is only 1 level left to create (all enemies and bosses are done) and after that will come the time for game balance and beta testing as well as integrating with the steam platform. We’ll keep you informed about the beta test and resume posting here and on social networks a bit more. Feel free to drop a comment here or on facebook if you are interested for the beta test. Here is another update from the game’s development. Bosses and enemies are done and we’re moving forward with the final level designs. Once this is done we’ll handle the game balance (enemies hitpoints, weapons damage, cooldowns and heat values, experience points for each level, etc.) and then hit the beta-test period. In the meantime, here’s a level preview. What awaits you in the heart of this level? What lies above this strange contraption? There haven’t been much updates here in a while. We have been pretty busy working on the game but also tangled up in the legal side of the business. We’ve been investigating all the contracting, licensing and business opportunities for the game as well as handling the way we will be able to sell the game in the (near) future. As for the game itself, the game is nearing the beta-test and is coming along nicely. It still needs a serious overhaul on some areas such as game balance (especially with the difficulty levels, item prices and experience points) and a few UI tweaks and the levels aren’t finished yet (2 of them are, though). We’re going to continue working hard and start posting more regularly again on this blog. DreadLog: The challenges of interesting level design. We’re going to be talking about how the game design and the level design changes enemy patterns and behavior based on what we want to achieve. In DreadStar, we chose to set the levels in distinct places (space, an invaded planet, an abandoned temple, a robotic IA complex, etc.) and the visuals already give the levels a strong sense of identity but we wanted them to “feel” different as well, when you play them. To achieve this goal, we decided that each level would play differently and that means that the enemies need to act a different way. The first available level is pretty straightforward, space invaded by pirates that must be taken down. Most enemies go forward, some of them firing , others don’t. 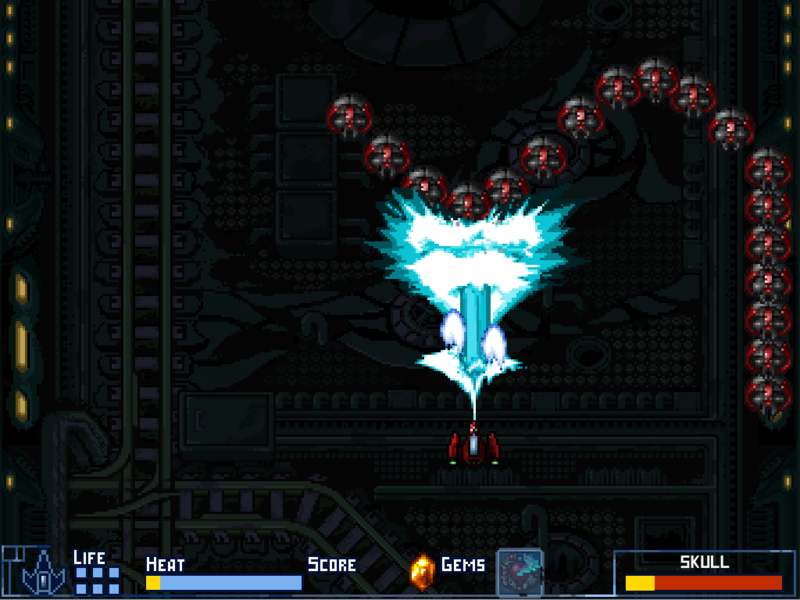 To still have an interesting level, some enemies are faster than others and some fire targeted bullets toward the player ship. 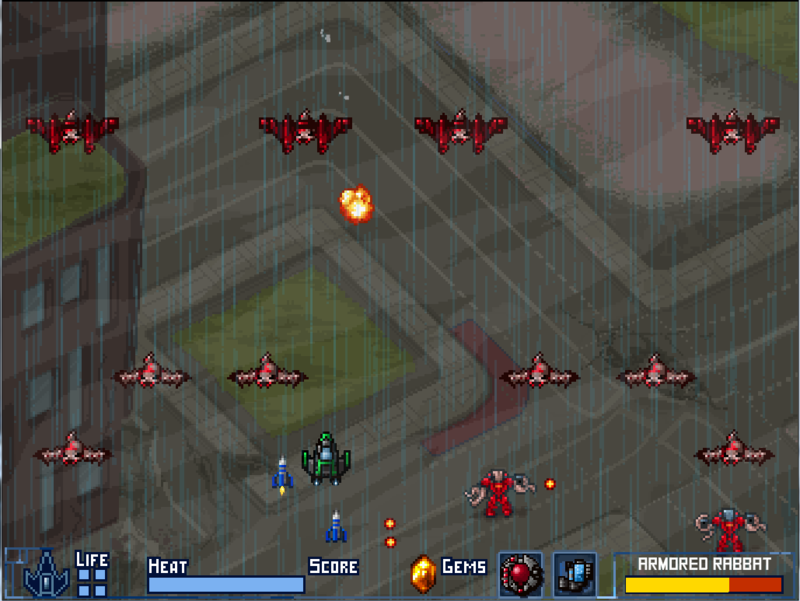 As in most shoot’em’ups, we included a midboss to break from the monotony and add a sense of danger. Both the midboss and final level boss are simple in their patterns and don’t go overboard. Think of this level as an introduction to the game’s mechanics. The second level is very different and is situated in a robotic complex home to a deadly AI that rebels against its creators (humans!). The visual setting being cold and mechanical, the enemies needed to be as such. Since it is the second level, we also decided the enemies would have much more movement and so it was only logical to use mathematical patterns in the movement of the enemies (such as sinusoidal movement (sine and cosine), circles, and that kind of AI type of logic). 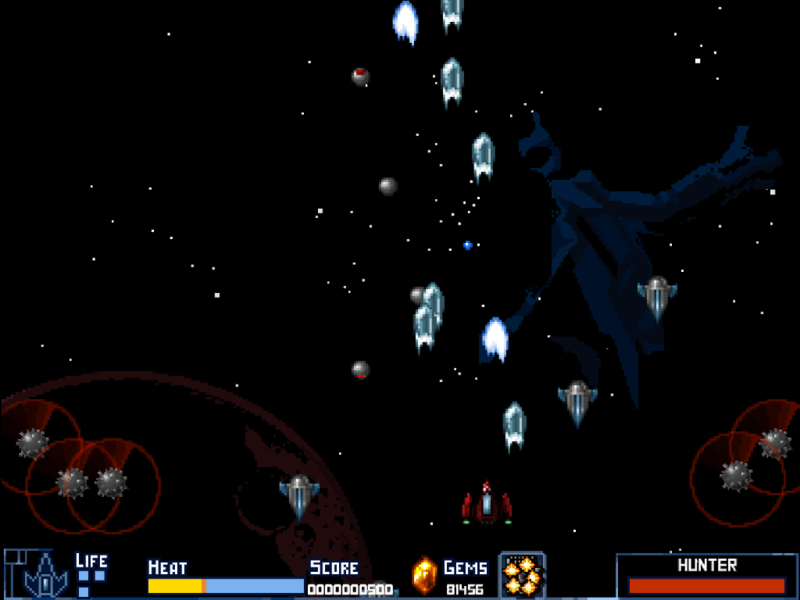 Less enemies are firing but they are trying to directly hit the player ship, sacrificing themselves in the attack. This level has 2 midbosses and 1 boss that consists in 2 different parts. The third level is a bit less interesting, design-wise, since it consists in an asteroid field that is generated using a pseudo-random algorithm. Since it is an asteroid field, it didn’t really make sense that the level would always be the same. Therefore, we decided to create an algorithm for randomly spawning asteroids, using several constraints so that the more you advance in the level, the more asteroids you’ll encounter, with higher chance for bigger, slow asteroids (with more hit points) and tiny, faster asteroids (less hit points but harder to avoid). There is no midboss for this level. The fourth level was very fun to design as we kind of went overboard with silly ideas and themes. It is situated on an infested planet where the inhabitants have woken up an ancient race of alien-like parasites. You must now save the survivors by eliminating the infesting aliens and the corrupted humans that have fallen prey to them. 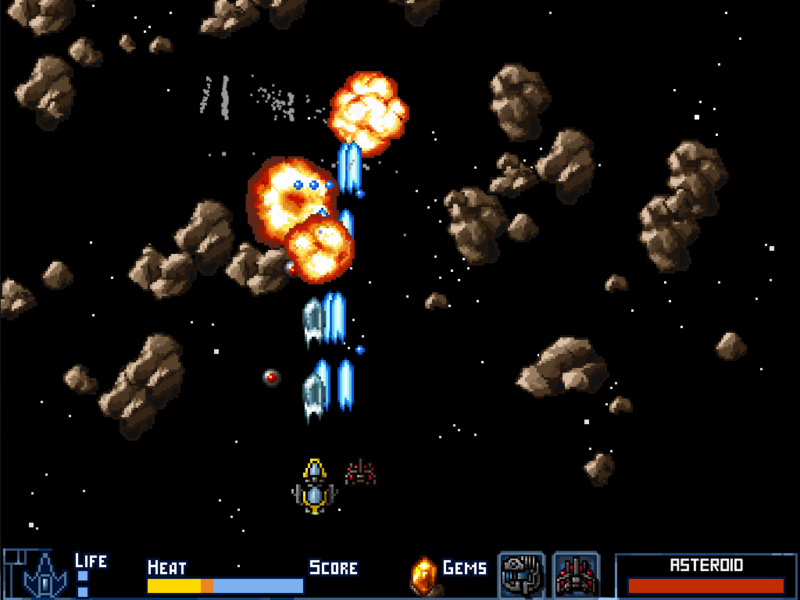 In this level, we went for classic shoot’em’up planetary elements: enemies that can be hit by bullets but don’t damage the player’s ship when you hover over them. They are on the ground and therefore represent no threat to your ship. To counter this fact, however, they shoot at you and killing them will make avoiding being hit much easier. For the rest of the enemies, we have a mix of what was available in the first 2 levels, each with their own movements but overall based on the same kind of ideas. 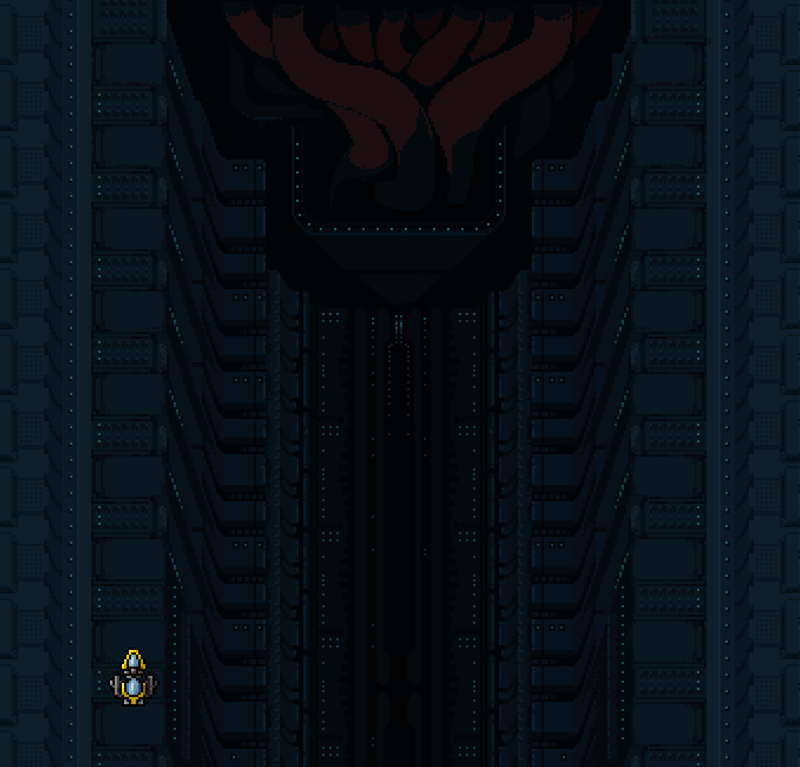 The midboss is an enemy generator and will spawn more enemies (forcing you to manoeuver in order to be able to hit it) and the final boss is, again, a 2 part boss that will probably surprise the players (we won’t be talking too much about it to keep that intact). 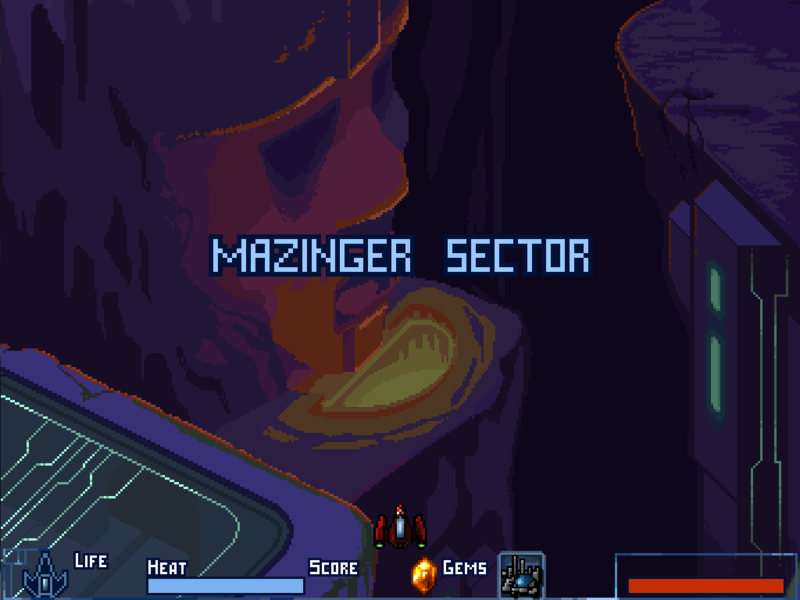 Finally, the fifth level is an abandonned temple, in a derelict space station. The level’s graphic design draws inspiration from ancient cultures with a mix of alien technology. To give a sense of size and emptiness, this level has no “enemy” but rather obstacles that you will have to avoid. This level has been designed with a key feature in mind: it plays like a race. You will encounter speed-up and speed-down bonuses that will make it harder or easier to navigate through the giant crumbling walls, flying platforms and tunnels that make up most of this enemy’s level. Your score will be higher if you finish the level faster. The midboss and the boss for this level use magical attacks and will require a lot of movement from the player in order to kill them. So, as you can see, the enemies were all designed with a specific goal in mind, adding to the level’s atmosphere and giving it a sense of purpose. We have also used background elements to help the player remember when a boss will soon be incoming and the different parts of the level. We hope you found this insteresting and thank you for reading up to this point. I haven’t posted here lately but i haven’t had much to show because i have been working on improvements and tweaks all around. Basically, i have tweaked the hitboxes for all the player ships, changed the tooltips and worked on small UI improvements. I have also been working on the last enemies that still need to be made (the new level 2 ones). They are among the last enemies to be worked on (we still need to finish a few bosses as well). This means the programming is nearly complete and we are approaching one of the final stages of the game’s development: the final level design and game balance. Once this is all done, the game will go into beta status and we will improve the game based on player feedback. This will also be the last hunt for bugs before integrating the game with the Steam API and getting ready for release. We are planning for an early 2017 release but we are still a few months away from that so stay tuned and in the mean time, enjoy this space dragon boss animation ! I’ve been working on level design since the start of the week and had to change the way some things worked in the levels. I also added a way to add an object or enemy at a precise point. That way, calculating the position of the background, i can add a background element in the exact spot it is supposed to be at. However, while it was working well, i thought that it would be better to have a view of the exact background in the level editor…especially since in this level, there are background enemies (enemies that are on the ground and don’t collide with the ship but fire at it). So i made those changes as well and i must say it is pretty fun to have a good view of the background as it will be in game. I wish i had the time to put all the graphics into the editor to have a 100% accurate view of the level but i really don’t. I’ll maybe do it in my free time (if i can find some). I am really looking forward to seeing people use the level editor to create new levels but that will have to wait until after the release! So far, i only have started on the overall design of this level, however so i must now hurry and finish the level before working on the Mazinger sector’s enemies. It’s time for another dev update as i finally finished the 4th level boss. Some gameplay from the boss turned out to be more complicated to program than anticipated and i had to change a few things in the core game engine. As everything is now complete on that boss, i can start working on changes to the level editor and start the level design (the fun part!). I need to make those changes because this level’s design is particular. We are using a lot of background elements that need pixel perfect placement, something the current level editor can’t do well except on fixed locations (useful for enemies, but not so much for background elements). 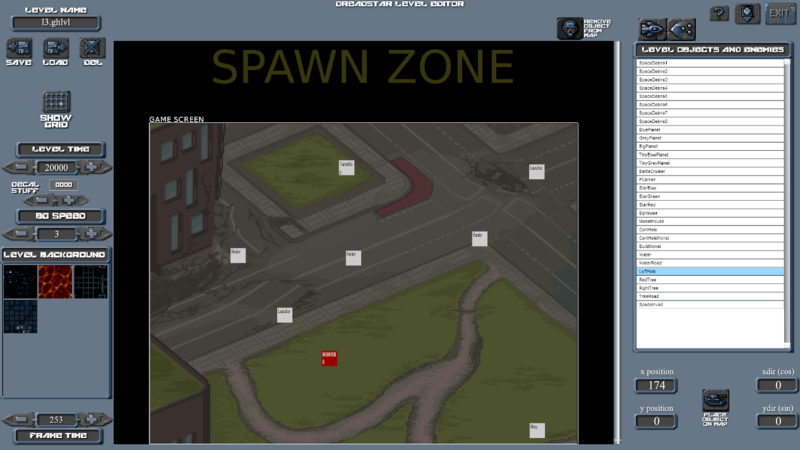 It will also be useful for the 5th level (and if/when we release the level editor as well). I’m hoping i can make those changes and have a good first rough of the level by the end of the week. 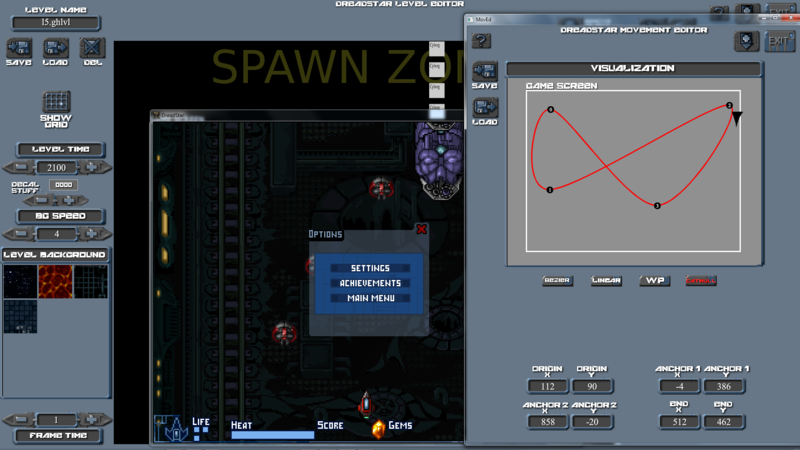 I’ll then start working on the 5th level’s enemies and bosses, along with the core mechanics of the level.